Children and poverty at the center of new Schmucker exhibit | The Gettysburgian. 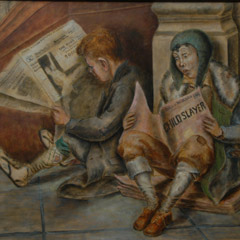 The Schmucker Hall Art Gallery is currently displaying an exhibit entitled “Pray for the People Who Feed You” Voices of Pauper Children in the Industrial Age. This exhibit, curated by Gettysburg College senior Rebecca Duffy, is comprised of a number of different forms of art, namely paintings, photographs, books and their illustrations, and even a poster. This variety is a main part of the exhibit’s success in portraying childhood poverty. The fact that the issue was displayed in many different ways shows that the issue was largely acknowledged. And it meant that there were many different audiences that could be reached and thus become informed on the issue. The artwork and the illustrations that were displayed from the novels were particularly successful in showcasing the pain these children were feeling. The majority of them shared a commonality in design, being that they had no definitive shapes or colors. They appeared as shadings with faces. The effect was that the people looked dirty and ghoulish, almost as if they were not there, a technique that helps in highlighting the pain they would have felt and causes you to feel sympathy towards them even more and to truly see the poverty in them, and how it had hurt them. Another intriguing work was a 1918 poster from the US Food Administration. On it was a sketch of a mother and her children, in the shaded style, and their poverty was clear. But the most fascinating part was a sentence in red that said “For three years America has fought starvation in Belgium.” A line that is thought-provoking in that it brings to mind the commonly held question of whether or not America gets involved in foreign issues before it helps its own country. It is these types of images, of not only hungry children, but working children that really put poverty into perspective. Duffy is showing through this collection of works what poverty used to look like, but poverty is still a problem. Her efforts show how child labor made things worse, it didn’t solve anything, but that doesn’t mean the issue should be left alone. All in all the exhibit was well-put together and truly meaningful. It is an exhibit that reminds us it is important not to forget history because it can still help us solve problems today, or at least show us what not to do. It is a thought-provoking collection that is well worth taking the time to check out. Gallery talk with Gregory Thielker: Oct. 8, 2015 5:00 p.m.